My absolute favorite color combo in the Summer is red, white, and blue! I just love the nautical vibes these colors have when put together. This outfit would be perfect for those Memorial Day BBQ's! Not only is this outfit super cute, but every piece in this outfit was super cheap! I got these high waisted Abercrombie pants on sale for 40$, the top was 15$ at TJ Maxx, and the accessories were a steal at Target. It definitely doesn't cost a million bucks to look and feel like a million bucks! I absolutely love shopping at TJ Maxx, I always find adorable pieces there that are unique and affordable. 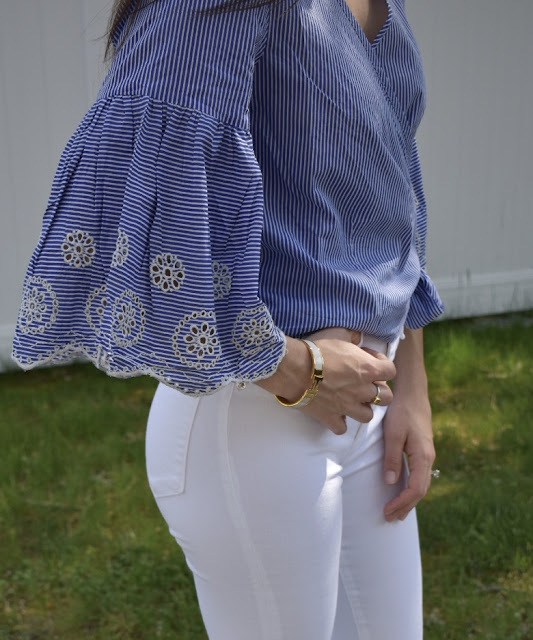 When I saw this pretty eyelet white and blue blouse I knew I had to have it. Unfortunately, I usually can't find jeans there because I am so petite, however Abercrombie has great jeans for petite gals! They make them in regular or short, which is great since I am 5'1. I wear a 00S for reference. Your best bet is to get them this time of year when they are on sale or else they can be on the pricey side. I will spend a little more on a pair of jeans that fit just right because I actually hate shopping for jeans and always have. They seldom fit how I want! When I was little I refused to wear jeans and would only wear dresses! Anyone else struggle with jean shopping?